A denture is a removable replacement for missing teeth and surrounding tissues. Two types of dentures are available – complete and partial dentures. Complete dentures are used when all the teeth are missing, while partial dentures are used when some natural teeth remain. 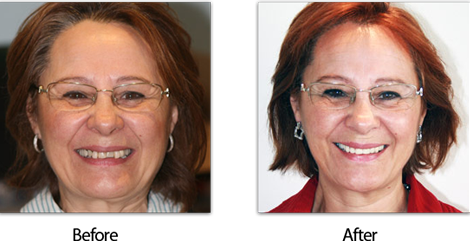 With modern techniques Smile Cliniq in London is able to make well fitting cosmetic dentures. Complete dentures can be either “conventional” or “immediate.” Made after the teeth have been removed and the gum tissue has begun to heal, a conventional denture is ready for placement in the mouth about 8 to 12 weeks after the teeth have been removed. Unlike conventional dentures, immediate dentures are made in advance and can be fitted as soon as the teeth are removed. As a result, the wearer does not have to be without teeth during the healing period. However, bones and gums shrink over time, especially during the first weeks following tooth removal. Therefore a disadvantage of immediate dentures compared with conventional dentures is that they require more adjustments (relines) to fit properly during the healing process and generally should only be considered a temporary solution until conventional dentures can be made. The presence of teeth helps to provide a natural facial appearance and can potentially help to increase one’s self-confidence. Furthermore, the denture fittings themselves can provide support for the lips and cheeks that can often take on a ‘collapsed’ appearance in patients with missing teeth. The ability to chew food correctly suffers if teeth are lost and can be improved by wearing dentures. This in turn means that food can be digested more easily as it moves through the body, helping people to take the maximum possible nutritional benefit from the meals they consume. Consequently, dentures can not only boost the health and appearance of the mouth and face, but also of the body as a whole. If teeth are lost, people can often find their ability to speak clearly is impaired, particularly in the case of the anterior teeth – namely the incisors and canines. Those who opt for dentures should therefore find that their pronunciation improves. All dentures of this nature are finished in high-impact very natural looking acrylic teeth, meaning they are able to stand up to the wear and tear that affects teeth on a daily basis. A removable partial denture usually consists of replacement teeth attached to a pink or gum-coloured acrylic base, which is connected by metal framework that holds the denture in place in the mouth. Partial dentures are used when one or more natural teeth remain in the upper or lower jaw. Yes! Dental implants can be used to support permanently cemented bridges, eliminating the need for a denture. The cost is usually greater, but the implants and bridges more closely resemble the feel of natural, teeth. Dental implants are becoming the preferred alternative to dentures but not everyone is a candidate for implants. The general steps at Smile Cliniq are as follows: A thorough dental examination and discussion as to which denture type is best suited to you, taking into account your requirements and budget. A full costing will also be given to you at this point. Interest free credit is available to pay in low monthly instalments to help with the cost of dentures. A series of impressions of your jaw and measurements of how your jaws relate to one another and how much space is between them will be taken. In certain cases we will make a laboratory made special tray to obtain a more accurate impression of your teeth. We will create models, wax forms, and/or plastic patterns in the exact shape and position of the denture to be made. You will “try in” this model several times and the denture will be assessed for colour, shape and fit before the final denture is cast. A final denture will be tried and fitted. A smile is so important; it tells everyone you are happy, confident and ready to get on and enjoy life. Consequently, the loss of teeth can have a dramatic impact on a person’s self-confidence and esteem. Not only are teeth important for smiling (aesthetics) and eating (function), but they also help support the lips and face. Missing teeth can result in difficulties eating, a self-conscious smile and a ‘sagging face’ appearance. Unfortunately a lot of dentures look false because they lack the attention to detail and are not made to meet the individual’s needs and requirements. Dr John Besford is one of the world’s leading authorities on the provision of dentures and has coined the term, ‘The British Standard Denture’ to describe this style of denture. Often the teeth used are too small, so too much gum is shown; the teeth are set too far back, so there is reduced support for the lips and the face; and the dentures look unnatural because the teeth are too uniform and the gums are too pink. The Enigma Cosmetic Denture System can provide natural looking teeth and gums. Natural teeth are not uniformly white and everyone will have slight variations in colour and little marks or features that make the teeth look individual. It took more than five years to develop the teeth in the Enigma System – a range of teeth that means that denture-wearing can be a secret shared only between clinician and patient. Enigma teeth not only reproduce the wide range of shades, translucencies and vitality of natural teeth but also assure exceptional strength and durability in the mouth. The picture shows some of the ways in which Enigma teeth mimic nature and so enable your clinician to provide the most cosmetic denture possible. 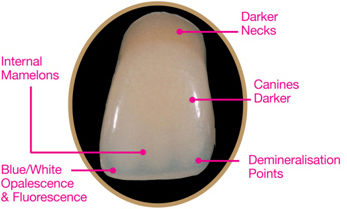 Natural teeth consist of dentine covered with a translucent enamel layer that gives depth to the tooth colour. Enigma teeth have a similar structure with a darker core (dentine layer) covered with an enamel layer that is especially visible at the tip. The blue white opalescence reproduces the effect of that different structure. Natural teeth brighten in strong sunshine and are still white under disco lighting. Many artificial teeth only do this weakly but the Enigma enamel fluoresces to mimic nature. The teeth next to the front teeth are smaller, lighter and have greater opalescence, whereas the eye or canine teeth are darker. Using these Enigma Teeth will add vitality and make the mouth look three dimensional – just like your natural teeth. In order to achieve a totally natural appearance it is important to consider the appearance of the gums as well as the teeth. Natural gums are frequently whitish near the teeth and the tissue varies in colour from a pink to a reddish colour. The natural gum colour of many ethnic groups has a brownish rather than pinkish hue. Within the Enigma Cosmetic Denture System are a range tools for individual colouring of the base to harmonize with your natural gums. Examples are shown in the photos below. The goal of cosmetic dentures is to replace what is missing from the mouth and ensure natural looking dentures that enable the wearer to talk, smile, and eat with confidence. The Enigma Cosmetic Denture System enables the clinician and dental technician to construct natural looking dentures that allow you to smile and enjoy life.